The Cross Country season is drawing to a close and it just keeps getting better. This is how it is supposed to be isn't it? 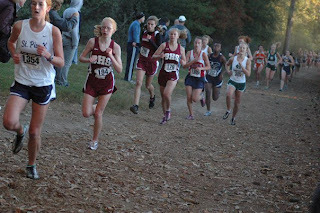 The last official regular season meet for my daughters was this past Saturday when they ran the Coach Wood Invitational at Gainesville College. The day was an awesome day for running. It was a little cooler in the morning for us spectators, but by the time the running started the weather was great. 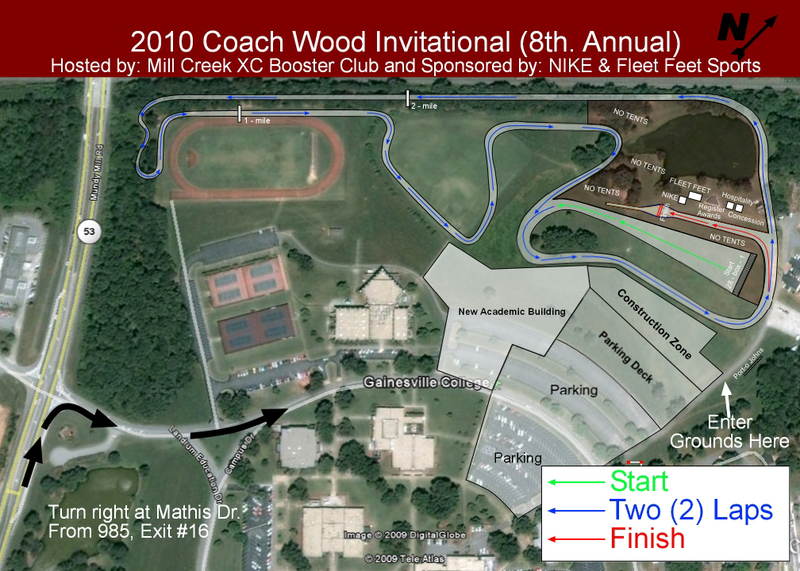 The course is a two loop course and is laid out pretty good, especially for the spectators. We are able to watch the runners at multiple locations, especially if we want to do some running ourselves. The starting was laid out a bit wrong this year and it ended up putting a protruding manhole directly in the path of some of the runners at the start. Of course one of the lucky teams was Brookwood. The first race of the morning was the Championship Girls race. This is the fastest race of the day and this was the race that Payton was running in. She and her teammates warmed up and got ready to start. The gun went off and the race was underway. As I mentioned above the manhole was right in their path and so they had to crowd the teams next to them to get a clear start. Payton and a couple of her teammates lost a lot of ground in this start and ended up boxed in way back. Payton was running a good race but was having trouble getting around some of the other runners and she continued to be boxed in for quite some time. I was encouraging her but also telling her she needed to work her way out of the pack. This went on for the first half of the race and I had to stop being nice. I started yelling a bit more and telling her she had no time left and needed to move NOW! She finally made her move and continued to pick runners off as she started to gain some of the ground back that she had lost. In the end Payton still had a great race overall. She finished third for her team, and 23rd overall, still receiving a medal and some much needed points for her team. 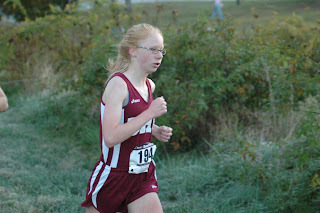 She crossed the finish line in 19:50 and the bummer was that she was only 10 seconds away from her 5th consecutive PR. The same 10 seconds also caused her to drop from #1 to #2 in the team rankings. This is not a big deal as she was never expecting to hold the #1 spot even that long given the return of the few faster girls from their injuries a few weeks back. 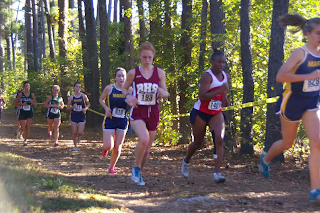 Following the boys Championship race, the next race up was the JV Girls A race that Ashlee was running in. This is the faster of the two JV races. Ashlee and her teammates warmed up and before you know it they were off and running. They too had the manhole to run around, but their path was not obstructed quite as bad. Ashlee started off strong but also conservative. She had talked to her coach before the race about trying a new approach of starting a little more conservatively so she would have more to work with as the race progressed. 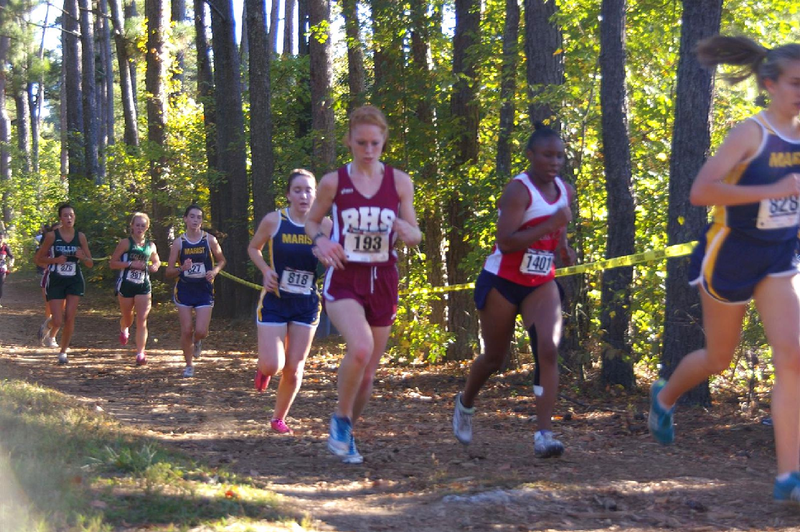 Ashlee was running a good race and was hanging in around 20th overall and sixth or seventh for her team. She was running comfortably and confidently. Her coach and I were running all over the course to cheer the girls on and keep them running strong. Near the end of the first lap we started to tell Ashlee to start picking off some of the other teams that were running just a little in front of her. By the time we saw her again she was running fifth overall and fourth for her team. She had taken nearly 10 or more since we had seen her last. Her coach was very pleased with her as was I. She has really made some great gains late in this season. 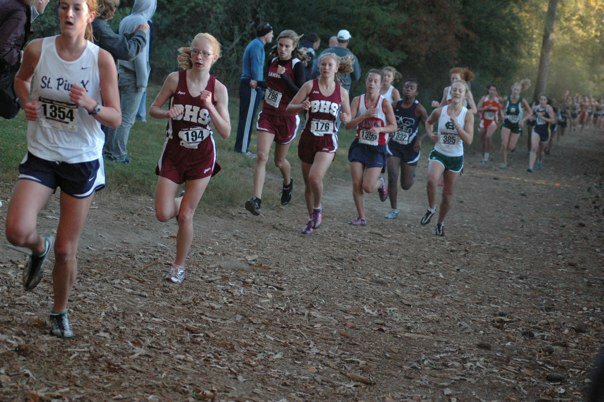 Ashlee had just one last opposing team runner in front of her. I told her to go get her on the home stretch but she just didn't have enough left, but yet the other girl did. The other girl ended up passing our next runner right before the finish line. In the end Ashlee finished fifth overall and fourth for her team. 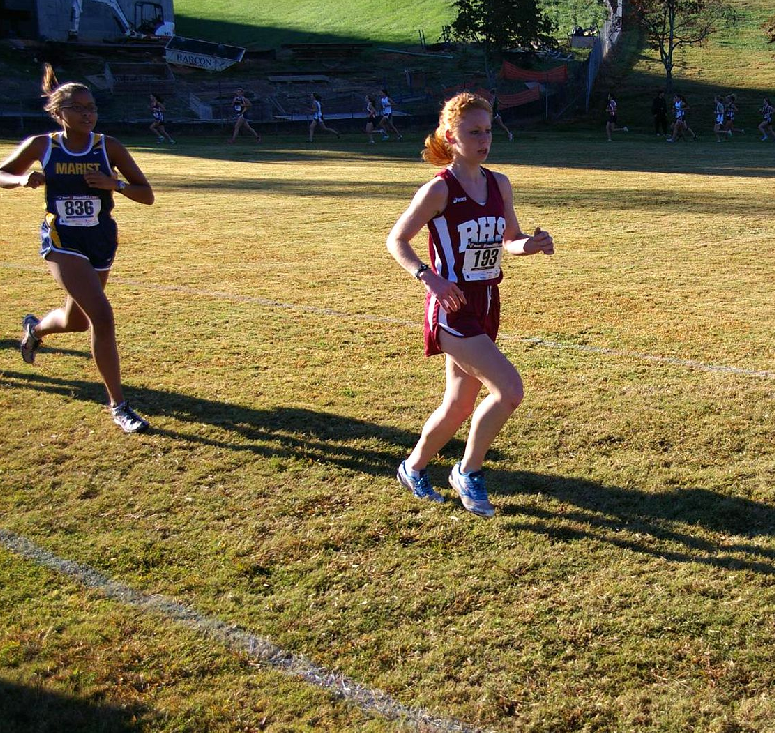 She ran an awesome race, and came in at 21:27, just 3 seconds shy of her BIG PR at the last race. These last two races sprung her to a 15th place ranking for the team, up from 19th where she spent most of the season. 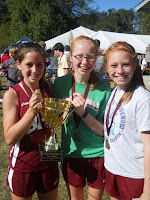 Both the Girls Championship race and JV Girls A race were won by Brookwood and I am happy to say that both of my daughters were key in bringing in the needed points for them to do this. I am so proud of them and how far they have come. I am looking forward to the next couple weeks as we move on to Region and then State. 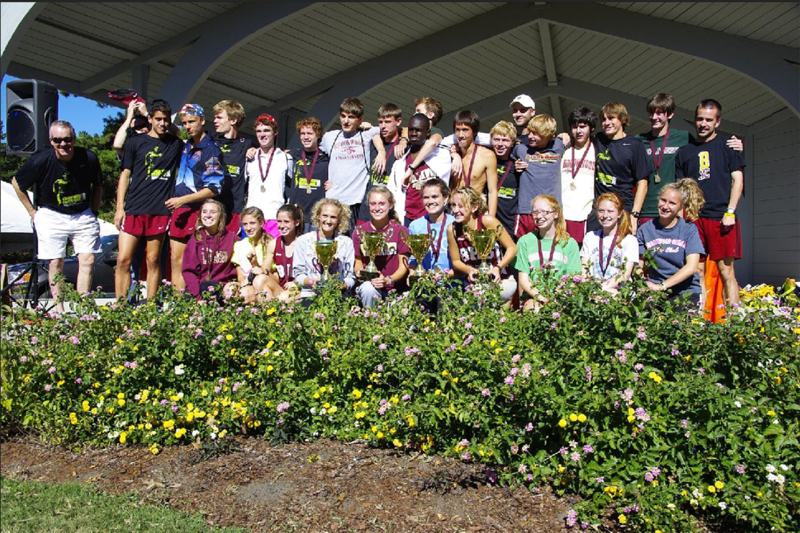 Another very cool item to note is that the Brookwood JV B Girls as well as all the Boys teams also won their races for a Brookwood Sweep of the Coach Wood Invitational (ESPN Article)(team pic). As the girls were hanging around waiting for the awards cerimonies they were taking some fun photos. 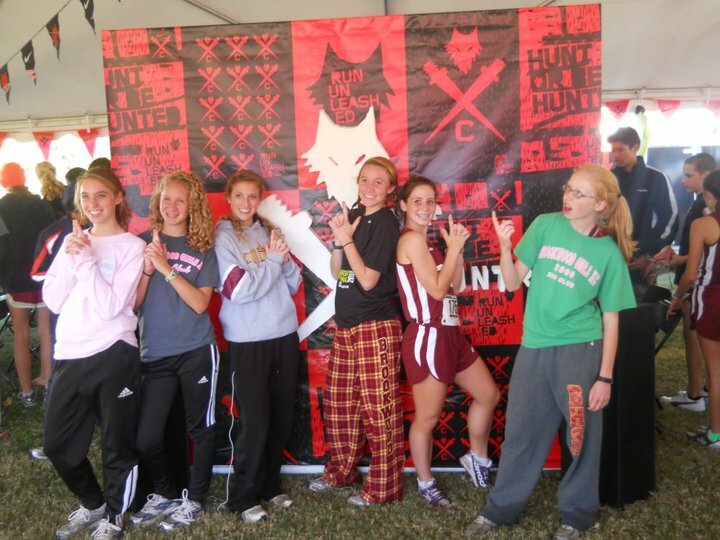 They came up with this fun Charlie's Angels type pose in front of one of the Nike backdrops. Payton (aka: funny girl) had to be herself and be a little different. As she put it - "A classic photo with a little bit of originality." Just as they were walking away a guy asked them to get back in the pose they had because he wanted to take a picture for the Nike publication (not sure which one, but would like to find out). He took their picture again and then proceeded to say "good job, except for you" as he pointed to Payton, "I will have to crop you out" Now, I have to say I have a problem with this. As a dad I felt bad for her because I know she was hurt. I understand they may not be looking for that in the picture, but if that was the case why didn't they let her know so she could do something more to their liking? They didn't even give her a chance to change. As she said it - "He asked us to get in the same pose, so that is what we did. Why was that not good enough?" Congratulations to both your girls! 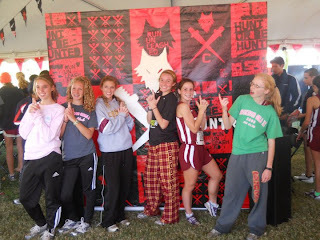 i hate the end of xc season! we still have county, upperstate and state i think here in SC. congrats to both the girls again! they are strong runners, i always love hearing about them both. Have you ever got lost on a run?